March 27th is the annual celebration of National Paella Day. Paella is widely regarded as the national dish of Spain, the varieties ranging from vegetarian to a mixture of seafood and meats. This one-pan rice dish from the coastal region of Valencia is traditionally cooked in a paellera (a large, shallow pan) over an open fire, its aromatic smoke infusing the ingredients. 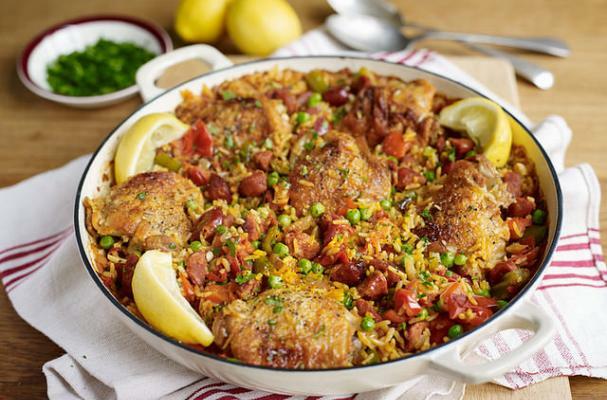 The following recipe is an easy bake-in-the-oven version featuring chicken, chorizo, onions, peppers, tomatoes, peas, garlic, and smoked paprika which adds flavor and depth to the dish. It also uses Amira Basmati rice in lieu of the harder-to-find bomba rice that’s traditionally used in paellas. For those of you basmati lovers, Amira also has a smoked basmati rice that we simply love! Step 2. Sprinkle the saffron threads into a small heatproof glass or bowl and pour over 2 tablespoons of boiling water. Set aside to infuse. Step 3. Add the oil to a large heavy based heatproof casserole and set over a medium high heat. When it is hot, add the chicken thighs, skin side down, and fry without turning for 5 minutes until the skin is crisp and golden. Turn the chicken over and add the chorizo, and fry together for a further 5 minutes. Step 4. Reduce the heat a little before adding the onions and peppers and frying for a further 10 minutes before stirring through the tomatoes, garlic and smoked paprika and Amira Pure Basmati rice. Fry for another minute or two making sure all the rice grains are well coated in the juices in the pan. Pour in the stock and wine, and season with salt and freshly ground black pepper, stirring well and making sure the rice is completely submerged. Cover with a tight fitting lid or snuggly tucked piece of foil and bake in the oven for 30 minutes. Step 5. Remove, stir through the peas and most of the parsley, recover and return to the oven for a further 5 minutes. Serve immediately, with a little extra parsley scattered on top and lemon wedges to squeeze over.